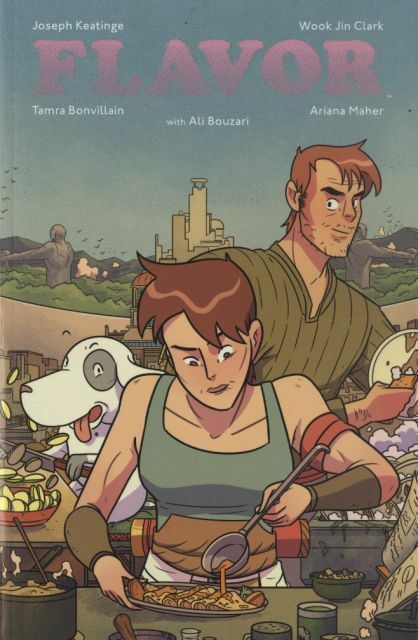 Image Comics' most delicious young adult culinary fantasy is served up in a collected edition! Within a strange walled city, an unlicensed chef discovers a mystery that threatens to end it all. Join JOSEPH KEATINGE (GLORY, SHUTTER) and WOOK JIN CLARK (Adventure Time: The Flip Side) on this culinary epic adventure-FLAVOR-where chefs are the ultimate celebrity and food is the most valued commodity. Featuring culinary consulting and an introduction by ALI BOUZARI, renowned food scientist and author of the IACP Award-winning cookbook Ingredient: Unveiling the Essential Elements of Food. Perfect for readers of Bone and Lumberjanes, but with way more crepes-and the world's cutest dog!